No 4. The Central “Beliefs” Defender. Do you remember a comic-book story about Billy and his Magic Boots? If not allow me to refresh your memory. Young Billy Dane had unearthed an old pair of football boots that used to belong to a famous football player called Dead Shot Keen, and whenever Billy put the boots on he would immediately transform into a player with amazing soccer skills, enabling him to win every game single-handedly. However, whenever he couldn’t wear the boots, which was often the main plot, he would be hopeless. You see, Billy’s skill, was nothing more than a belief he had in those magic boots. In much the same way, we need to find some magic boots of our own to believe in, to achieve Premiership Health. I guess apart from the comic book heroes, like: “Billy Dane” and “Roy of the Rovers,” the player who first gave me the belief that football was something more than just a game, was Laurence Paul Cunningham, the Albion winger in the great, exhilarating team of the late 1970s. Laurie, was the first professional black player to represent England and was the first Englishman to play for Real Madrid. He was the most naturally gifted player I ever saw, with the balletic ability to glide past opponents and dance the ball into goal. However, his footprints off the field were far-reaching and game changing. 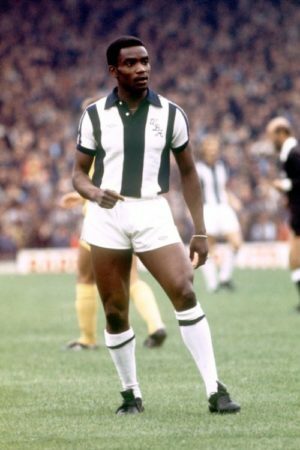 Cunningham – La Perla Negra, together with his Albion team-mates, Cyrille Regis and Brendon Batson, helped to break through the discriminating tensions of the time and transform people’s racist beliefs. By playing with grace, style and most of all dignity, they sowed the seeds for a racial integration born out of respect and admiration and shone the light for generations of black players to follow in their footsteps. “First and foremost I’m looking for respect from fellow players, if I can get through this maybe it will lead to others getting a fair chance.” Laurie Cunningham. Wherever he played, Laurie, had the ability to transcend prejudices, breakdown barriers and remains the only Real Madrid player ever to be applauded at the Camp Nou (the home of Barcelona). “Laurie was more than a footballing phenomenon, even more than just a pioneer, he was a force of nature ahead of his time. Touched by genius, blessed with elegance, and supremely confident in his own abilities,…” Jak Beula. He was indeed more than just a football player, an ITV documentary on his life was entitled: “First Among Equals” and depicted a man with a love for life, who designed his own clothes, painted portraits and loved music and dancing. After his tragic death in a car crash in 1989 at the age of just 33, his best friend Cyrille Regis, became a born again Christian – even in death, Laurie had the ability to change beliefs. At numbers 4 and 5 in your team line-up, are your central Beliefs and Values. These pair work together as a tight-knit unit and help to underpin both the team’s defensive and offensive play. They make the crucial tackles and also begin the build up to any attack. You may not have thought about it, but, your beliefs and values are ultimately the foundation for a healthy and happy life. As central defenders, these two can strengthen your immune system tremendously, and make life a lot easier for the Health Keeper in goal. They can ensure you maximise the healing power of any treatment/medication you receive through the placebo effect and as the relatively new field of Psychoneuroimmunology (PNI) demonstrates, they can actually kick-off the biological processes that lead to Premiership Health. In today’s fast moving game, Premiership Health Central Defenders, need to be play-makers, comfortable in possession and confident to carry the ball into the opponents half. Possessing the flexibility and adaptability to deal with the challenges ahead.